It's all very well getting privileged rides on demonstrators, and I truly appreciate them as it's good to get as many opinions from as many different angles as possible. It's important to hear what the engineers think, as they have to keep the vehicles on the road. But it's equally important to hear what the drivers think as they have to sit in them day in day out, and I provide the passenger's judgement. So this morning I drove to Wangford, had an argument with a resident about the legality of parking by unmarked bus stops (it's legal) and waited for the E400City demonstrator to come in. 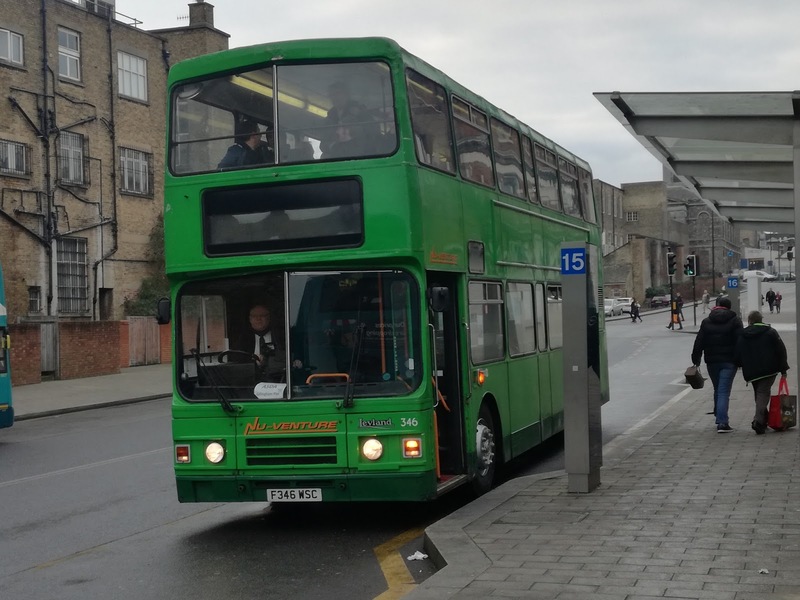 This particular driver and I go back the best part of 28 years, when we were both working in the Dartford area although at different depots, so I knew I'd get an honest appraisal of the E400. The verdict was "I've driven worse". Thinking about it that is the perfect summary for this bus. There are some good points but also some niggly frustrating ones too that could be solved with a bit of thought. Banging ones knees on the dashboard isn't good, even if you are on the tall side. The steering wasn't enthused over, nor the delay in the retarder releasing. It's those sort of things I could never know just by riding them, and I think manufacturers should consult with drivers a lot more than they currently do. The more I travelled on it the more I realised that the ride was distinctly uncomfortable. It looks great, sounds great and the layout is brilliant. Yet I was still left thinking it could, and really should have been so much better. Who, for example, thought non stick tables are suitable for buses! The moment the bus turns or brakes whatever is on the table goes flying! The rear seats upstairs are amazing, yet there is no bell push in reach - the nearest one being in the rear of the seat two rows in front. Why does the heating panel in the stairwell get extremely hot the second the heating is turned up? Why is the suspension so rubbish! However, I wanted a second opinion and so I met up with Cameron Robinson at Norwich and we rode back to Thurton on the demonstrator. I was particularly pleased it was Cameron as we rarely agree on anything. He thinks buses I loath are great and vice versa. But most importantly he is young and doesn't carry the rose tinted specs about the past I do. He missed out on Bristols, Metropolitan Scanias, Leyland Nationals et al. Cameron was born into a world dominated by Darts, Tridents, Flolines etc and so I wanted his opinion of the E400City. Lo and behold he agreed with me, that it was ok but could be so much better. However, there was a more important test. We alighted at Thurton, crossed the road and caught the X22 back to Norwich. If you cast your mind back to November 2015 I ventured up to Scotland to try out as many new buses as I could, only to reach the conclusion that the best bus around was the Gemini 1 bodied Volvo B9tl. So we put that theory to the test by jumping straight onto 37563, deliberately to compare it to the E400City. The bus was virtually full when we boarded, yet roared away up the hill from Thurton putting the E400 to shame. It was also quieter, much quieter. Not a single rattle, a smooth ride making typing on the phone easier and even Cameron was in no doubt that the Gemini wasn't just better, but markedly better. Now for the statistic that is either impressive or worrying depending on your viewpoint. The demonstrator has done around 7,000 miles and I have a feeling could be a complete wreck in 6 months. When we got to Norwich I asked the extremely friendly driver of the X22 what the mileage of the Gemini was. I thought it would be high but even I wasn't expecting to hear 766,000 miles. That's round the world almost 30 times. The demonstrator has barely crossed the Atlantic. 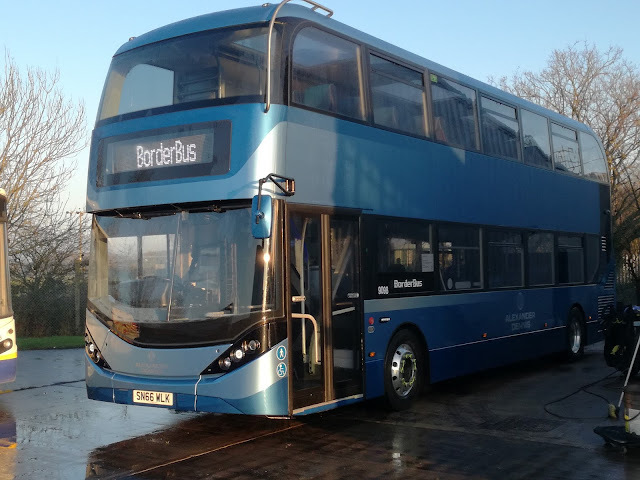 So yet again I have to ask WHY a bus 8 and a half years old with 766,000 miles on the clock is better in just about every area than a brand new bus, built for an exhibition. What can't we do now that we could then. Even Wright's own newer bodies are no match for the Gemini 1. I was so pleased it wasn't just me though, and someone from the younger generation agreed with me. Thanks, Cameron - perhaps I'm not quite the grumpy old man I thought I was and my dissatisfaction with new buses might be justified. As for the E400City - well as the driver said - I've been on worse. Cameron also came up trumps later in the day. 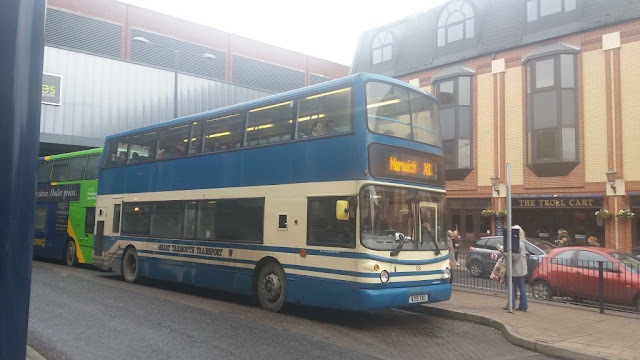 As we came out of Norwich on an E200 that Cameron noted rattled less than the demonstrator (BB60 BUS) we saw Yarmouth Transport liveried Volvo B7l 59 on a very rare outing on the X1. 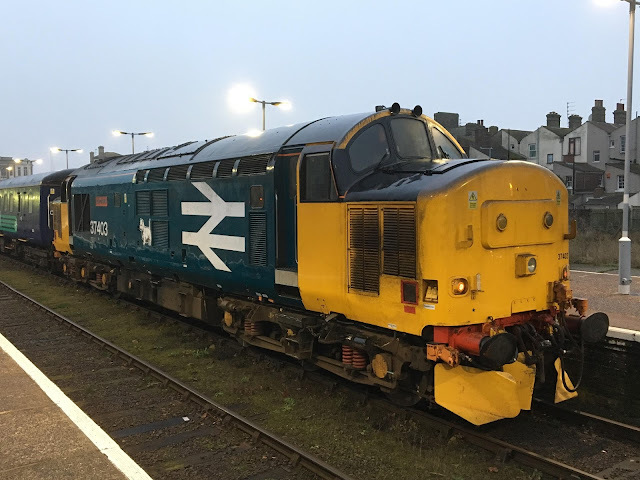 Cameron did some digging and found a pic taken in Yarmouth by Simon Austin who has kindly agreed to allow it to be published here. Thanks Simon. 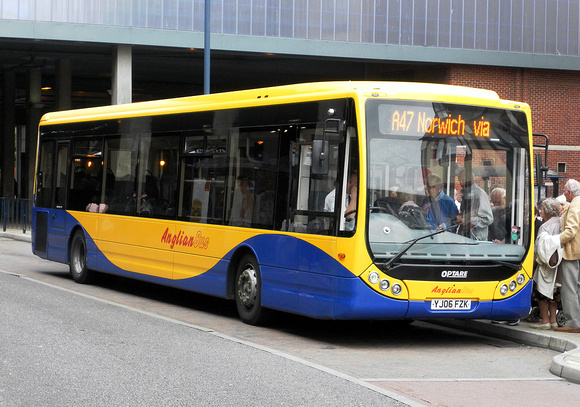 It has also been reported that former Ipswich Buses MD Jeremy Cooper, who left the Suffolk operator at the end of last year has taken up the position of Acting Commercial Manager at Anglian/Konect. As yet that's all I know but also of note is Ipswich Buses are yet to advertise for a replacement MD. If I hear anything else of substance I'll report it here. This was not meant to happen. 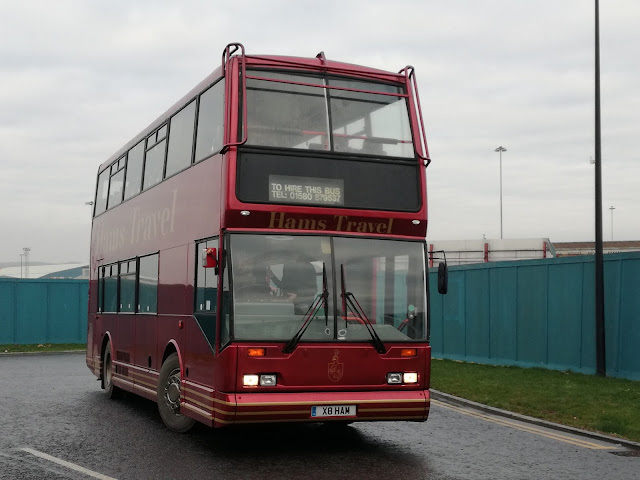 Still trying to shake off the most stubborn of viruses I woke from my slumber yesterday afternoon, yes afternoon, to find an email from Lord Pursey of Beccles telling me an ADL E400 demonstrator had arrived at Borderbus. Not everyday Suffolk gets a taste of the future so knowing I'd suffer today for it I ventured over to Ellough Industrial Estate to have a look. And rather pleased I was to have made the effort as she is a bit of a stunner. I mean look at that!! As is customary on these occasions we went out for a drive, although it was limited to Colin and myself as management were driving school buses! First noticeable element was the power. The Cummins engine living up to its reputation and giving much more power than either the Streetdeck or Metrodecker. Top speed attained was 64mph, and the engine noise on the lower deck at speed was pleasingly quiet. Even managed to sound like an Olympian which is no bad thing. Braking was smooth and quiet, and anything that makes Colin's braking smooth has to be applauded! But, and it is a but, I still don't think the overall ride matches the Metrodecker. It wasn't as easy to type on - an essential test these days, and the suspension not as comfortable. Rattles were minimal but somehow I always felt on edge expecting one to appear any time. The aircon is typically noisy as all ADL buses are, and something has to be done about a very hot panel in the stairwell which I wouldn't want any small child of mine to touch. 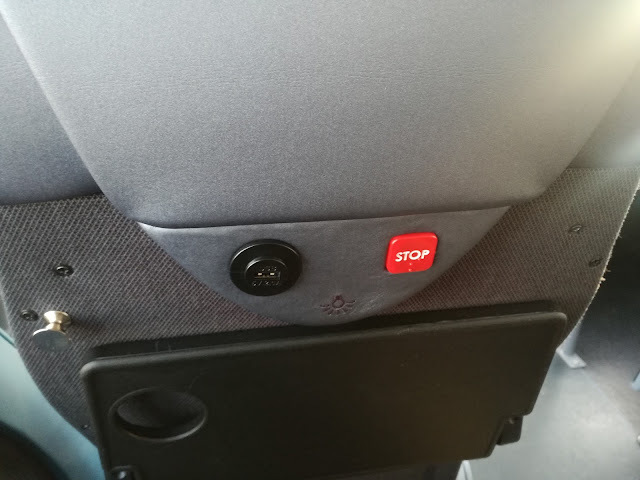 Bell push, USB point and drinks tray all in the seat! Having said all that, though, the E400 City is a very nice place to be. Granted not everyone will have it as high spec as this demonstrator but I liked it. 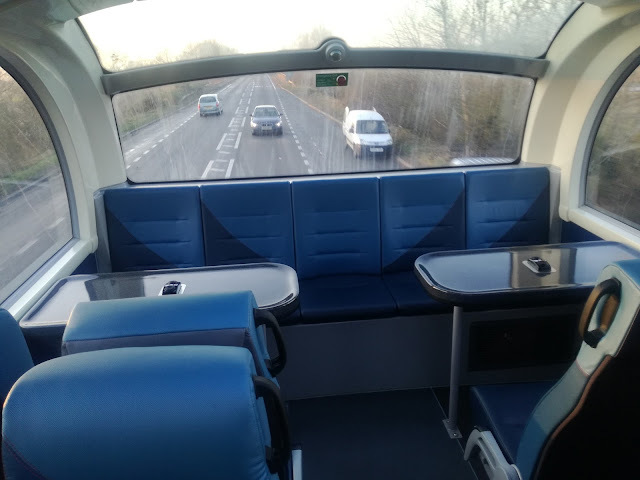 I just wish the final push had been made - still too much shiny cheap plastic, flimsy destination screen door, and why oh why aren't the non coach seat seats more padded? Anyone downstairs rightfully moving to the back to give the more aged passengers the front seats suffer as the rear seats are far inferior. The bus is good, very good, but you are left with the feeling that it could be excellent with just a bit more application and thought. In my opinion the E400 City is the best looking bus on the market right now. The engine is the most powerful, but over all I would still buy the Metrodecker and maybe put the Cummins engine in it. What was noticeable is that the good and great at Borderbus were only comparing the E400 with the Metrodecker. The Streetdeck didn't get a look in having failed to impress in any aspect. The E400 City is here for at least a week and will be out on the 146 on the longest duty. My thanks to Andy, Dave and Colin for the usual welcome and natter. I'm suffering today but it was worth it! 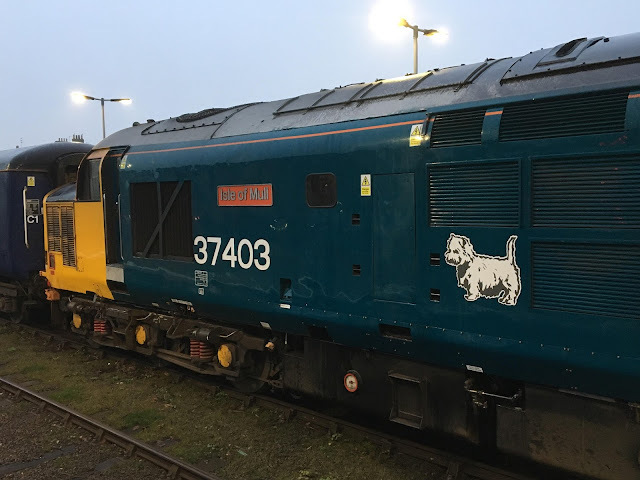 It has transpired that 37403 lasted one trip before failing and as I type 37403/405/419 are all on their way to Crewe so right now there are no 37's at Norwich and Short Set is redundant. Those pics above could become collectors items. More info as I get it. What Went Wrong With The 7? At last some news to report. 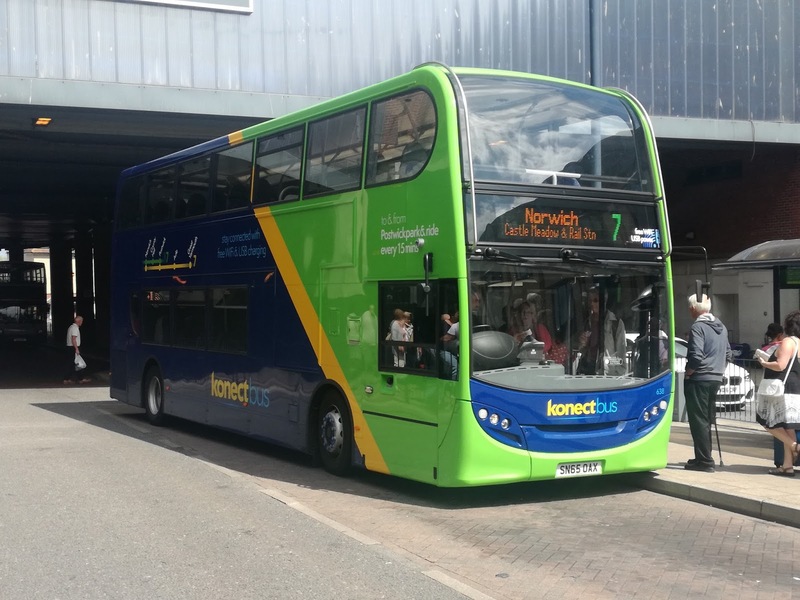 Sadly it's not good news as it was announced on Norwich Bus Page yesterday that Konect are cancelling the 7 between Norwich and Great Yarmouth as of March 12th. At the same time the 73 between Wroxham and Yarmouth, and the 72 between Norwich and Yarmouth via Blofield will also bite the dust. So what has gone wrong? Why could the 7 never match the X1? We need to go back in time. 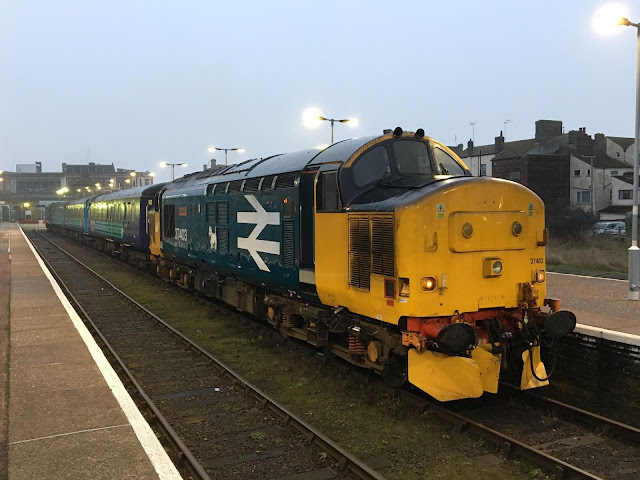 Initially Anglian had the aptly named A47, which provided a useful hourly service between Norwich and Great Yarmouth via Thorpe, Brundall, Blofield and Acle. From my understanding it was pretty well used. Then the X47 came along, which tried to compete with the established X1. Eventually Go Ahead decided to axe the community serving A47, to much chagrin I seem to remember, and throw all their eggs in one basket. The X47 was re-numbered 7, launched in a blaze of erm little vinyls, and proceeded to basically run empty all day between Norwich and Yarmouth. But why? If you are to compete with an established service it isn't good enough to merely match it, you have to better it. At no point in the last 4 years have any of Go Ahead's attempts to compete with the X1 come close to matching it, let alone bettering it. When the 7 was launched, the X1 was operating a 15 min frequency between Norwich and Yarmouth, with two services an hour on the main Peterborough - Lowestoft run, and the other two services on the X1 "shorts". The Excel services operated by comfortable Volvo B9 Geminis, and the "shorts" operated by either coaches or very comfortable Olympians. The route went the quickest possible way. 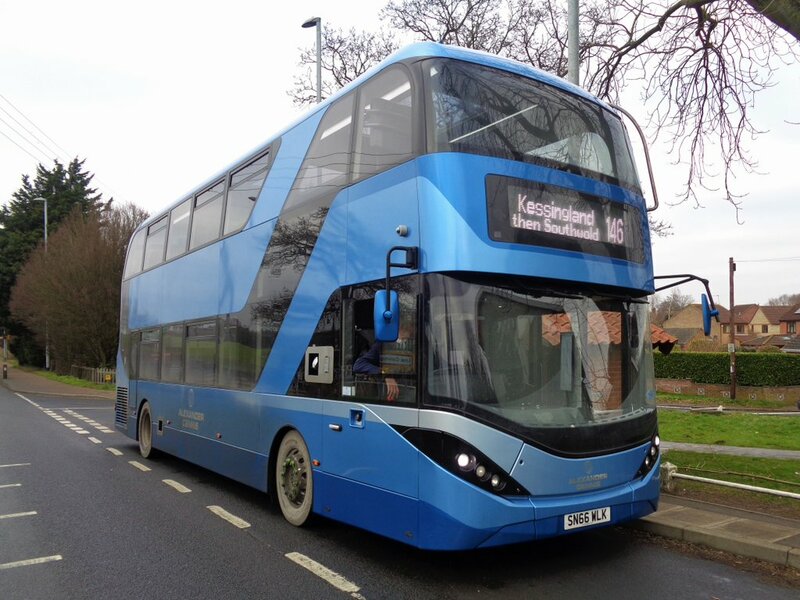 The 7 tried to keep the link to Norwich Station and Thorpe running a 20 min frequency using hard seated Scania Omnilinks. Trouble s they had annoyed the locals by axing their village links, so loyalty wasn't in abundance. 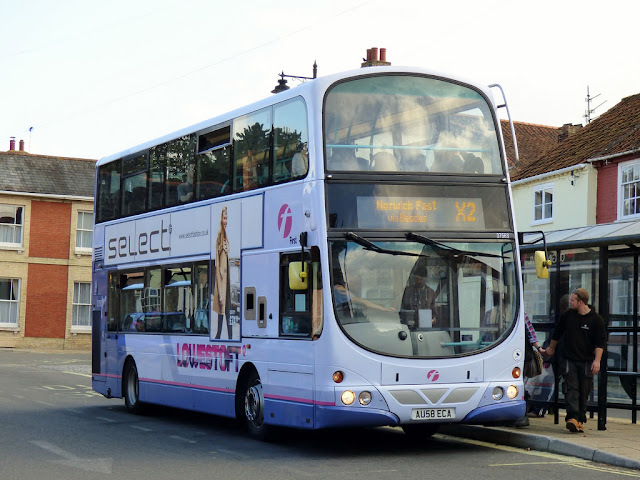 The 7 took longer than the X1, was less frequent than the X1, the buses were less comfortable than the X1, there were less connections in Yarmouth than the X1, the 7 didn't run evenings and Sundays like the X1, yet Anglian expected it to succeed. It didn't. So Anglian revamped it. The 7 was linked up with the 61, formally 601, to provide through journeys to Lowestoft, Kessingland, Southwold, and even Halesworth. Gas buses were utilised, and parts of Lowestoft without a through service to Norwich gained one. Things were looking up, but still not so much as a dent in the X1's dominance of the Yarmouth - Norwich corridor. I had a theory. Any excuse! Anglian Gas Bus 100 on the 7 at Norwich with a dancing Streetlite. Great Yarmouth is a major holiday resort. So, to a lesser extent is Lowestoft. Anyone with kids will tell you given the choice between a double and single decker which one they will choose. The same old ladies who moan like mad about double deckers in their normal life will fight each other to grab the front seats upstairs while on holiday. No matter how good the gas buses were they weren't going to grab the holidaymakers. And still the 7 didn't run late enough to encourage those going out for the evening to use it. Then the cuts started. The 62 between Kessingland and Halesworth was scrapped, the 20 minute frequency from Norwich became 30 mins, stopping at Lowestoft, forcing through passengers for Kessingland to change buses that didn't connect, fare promotions in Lowestoft weren't matched, and Anglian lost in a pretty dramatic way. Numerous routes in Gorleston were tried and failed and eventually Konect decided to take over the 7, extending the Postwick Park & Ride services to Yarmouth. Plus points were comfortable deckers with wifi and usb charging points. But only a 30 min frequency, extended journey times by having to serve Postwck P&R site, and still no evening or Sunday service. Who, exactly, was the new 7 trying to attract? At the same time Anglian extended the 61 to Barrack Estate, proudly proclaiming the fact that the recently severed link from the estate to James Paget Hospital had be reinstated. Hang on though, did they actually stop to think why First had cut that link anyway? The 2 went an interminably long way round between Gorleston and JPH, so very few people used that link anyway. Change at Market Gates and you have a million faster alternative services. Why wasn't the 7 extended to Barrack Estate, in a loop via Yarmouth Seafront, which is crying out for a service, thus providing a direct link to Yarmouth Seafront from Norwich. It gives people a reason to use the service, gives Barrack Estate a direct link to Norwich - I'm sure the demand for that is greater than a bus to the hospital - and with the right publicity and marketing, not to mention promotions with various seafront attractions you might have a chance. Why not link up with the 8 to restore the cross Norwich link lost when the X1 split? But this is Go Ahead. So the 7 is going. That's that. If you work at Broadland Business Park and get the 7 from Yarmouth, and I know a few do, then you are basically abandoned. First take note. Another nail in the coffin of Go Ahead which has been a disaster in this region from start to present. Also worth noting is that there was extreme driver resistance when Konect took over the 7 as they expected P&R drivers to suddenly operate normal services taking peasants not car drivers. Go-Ahead not clearing things with drivers before implementing? Who'd have guessed such a thing! "This space is reserved for wheelchair users, however if vacant then buggies may be stored until a wheelchair user requires it". Alternatively: "Mums - get off your fecking phones, get your child out of the buggy and do some parenting!" It was also revealed yesterday that Abellio have sold 40% of the Greater Anglia franchise to Japanese company Mitsui. This has led to protests from the usual suspects claiming it undermines the franchising process, including politicians from a party who conveniently forget we currently have an un-elected Prime Minister! Abellio, who originally submitted their proposals in partnership with Stagecoach have said they always intended to find another partner. If I was Minister of Transport I would be on my knees BEGGING the Japanese to come and sort our railways out. I read yesterday that in Japan if a train is 10 minutes late it makes the papers! There would be no rain forests left if that happened here. I welcome Japanese involvement in our railways and believe it can only be a good thing. They do not have the typically British "That'll do" attitude. Finally I have been under the weather for a few weeks now, which is why the number of posts have dropped off. That and nothing to report of course, but hopefully over the coming weeks things will improve. Fantastic Beasts & Where To Find Them? The answer is Chile. 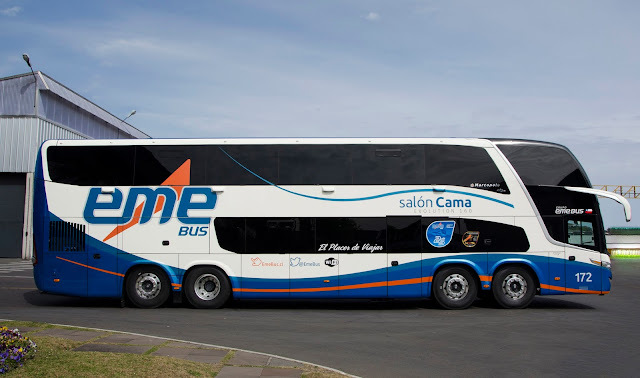 I saw this magnificent coach on the Brazilian blog Onebus Fotos de Onibus a couple of months ago and immediately contacted the owner to get permission to use the pics. Unfortunately he was on a long sabbatical but today got in touch and I'm delighted to be able to share the pics with you. The blog is n the links section and I advise everyone to keep the occasional eye on it as there are some extraordinary vehicles out there. Accompanying the pictures is this article. Please note this article has clearly been through Google Translate although a power take-off would look truly spectacular and be a good congestion busting tool! 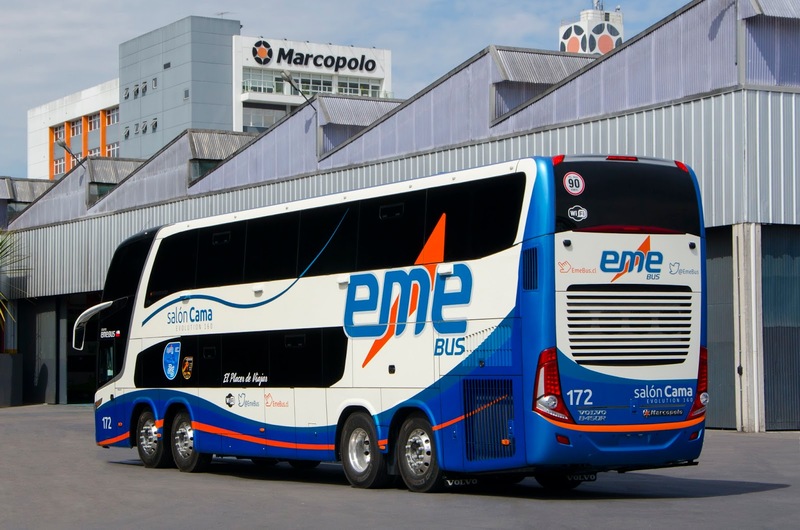 Marcopolo delivered 32 new Paradiso 1800 Double Decker buses to the Chilean operator EME Bus, one of Chile's largest bus companies. The vehicles incorporated into the company's fleet will be used on interstate and inter-municipal routes in the country. According to information from the export manager of Marcopolo, Ricardo Portolan, the Chilean market is warm and the main companies in the country have been looking for the renewal of the fleet this year. "Chile is one of the countries that most buy double-decker buses from Latin America. Local operators invest in more luxurious vehicles with great technological resources. The focus is always to offer more benefits to passengers, "emphasizes Ricardo. Mounted on two different chassis (Scania K440 8x2 and Volvo B450 8x2), the vehicles manufactured for the EME Bus have a total length of 14 meters and a capacity to carry up to 57 passengers, of which 48 are in armchairs in the semi-bed configuration of 1.09m Width located on the top floor and 9 more on the seat configuration seats, located on the lower floor of the bus. 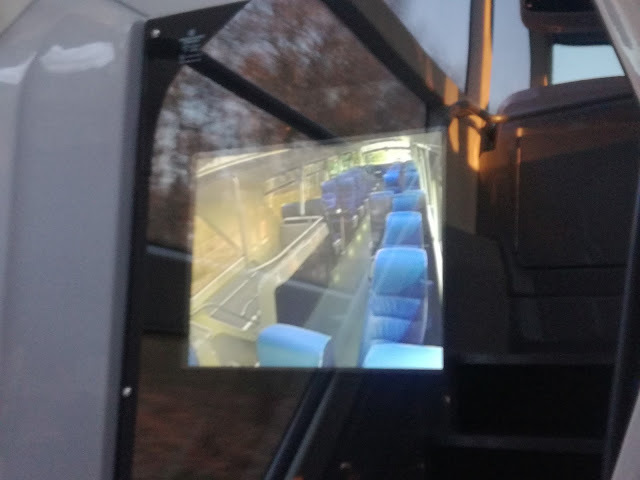 All buses have 2 refrigerators, a liquid heater, power take-offs with USB roads scattered at various points in the salons for electronic devices, on-board computer, two air fresheners, heating, air conditioning system and system preparation. Monitoring and audiovisual with five monitors, DVD player and AM-FM radio. The lighting of the passenger halls is all composed of indirect LED lights, which create an environment of comfort and sophistication. The LED's are also present with touch-trigger on the reading lights of the door lights, which also feature individual air-conditioning outputs, headphone jack and volume control. The foci also have built-in audio amplifiers. 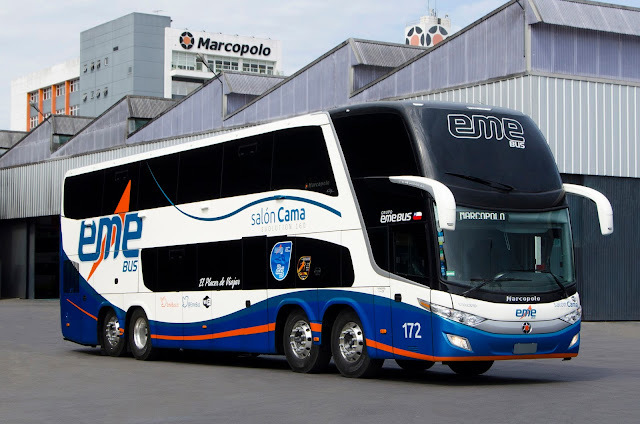 My thanks once again to my friends in Brazil for allowing me to share this with you - I do know First are looking at replacements for the X1 E400's at some point this year. It might mean a couple of tweaks to the route but..... National Express also take note - have a fleet of these as opposed to the Levantes and passengers would desert the railways in their thousands. The second part of last week's Medway Running Day coming soon. Sorry for lack of posts recently. DDA Day Part One - A Step Too Far? Never before have there been more bus Running Days over the festive period than there were this year, as the day the huge majority of bus enthusiasts were dreading finally arrived, and step entrance deckers in public service were consigned to history. Operators up and down the country marked the occasion by giving the old war horses one final outing. I went down to Kent to a Running Day organised by Nu Venture and was pleasantly surprised by the turnout, and boy did the memories flow. Hang on a sec though - did I say old war horses? Sorry the 37's on the Short Set are old war horses - they are 55 years old this year. 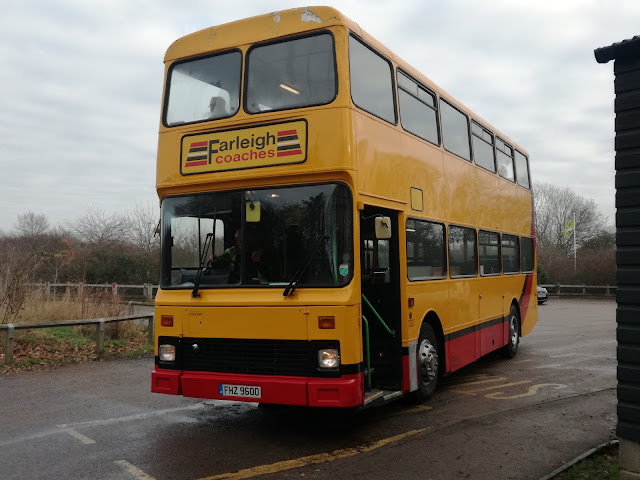 The final bus I went on yesterday, heading for retirement is 18 years old. That's not old. My car is 15 years old and I don't regard that as old, doesn't drive like an old car either. To put it in perspective there has been media coverage about the average age of the UK rail fleet this week. It varies depending how sensationalist the report is, but the general consensus is it's about 24 years old. That's the average remember not the oldest. If the UK bus fleet was the same the average age would be K registration, and there are precisely zero K registration buses in regular public service in the UK now. Some might say that's a good thing, and it would be if the new buses were any better than the old ones. But they are not. OK engines maybe cleaner, Chantelle and Kayleigh can wheel their buggies on board and be able to concentrate on their Facebitch status rather than their kids throughout the journey, meaning everyone else has to struggle past, causing delays, and some now have air conditioning - essential in our tropical climate. But in other areas they are no better. Fewer seats downstairs so more people forced upstairs - remember when there were 33 seats downstairs - lucky to get that on single deckers now. Ride and built quality isn't a patch on 30 years ago, Brakes that "harness the konetic energy and return it to the batteries" - oh do shut up - just mean jerky brakes. New buses have had to be built at a rush to meet demand and I'm not looking forward to an 18yo E400 - the longevity just won't be there yet new buses cost the earth because builders know the operators have had no choice but to buy.. Operators have been forced to either buy new or make expensive conversions whilst binning perfectly good vehicles in order to cater for a huge minority of passengers. Why couldn't the legislation have been less black and white and dictated that a certain percentage of the fleet had to be easy access, that all routes had to have a certain proportion of journeys operated by easy access vehicles and those journeys had to be indicated on the timetable, just like they were when easy access vehicles started to appear in the late 90's. Then fleets could be updated naturally, no rush, less expense, and perfectly good buses not needlessly scrapped. But no, common sense did not prevail and as such I found myself at Chatham with very mixed feelings. I parked up at Rochester Airport - yes there is one - and caught a service bus into Chatham. 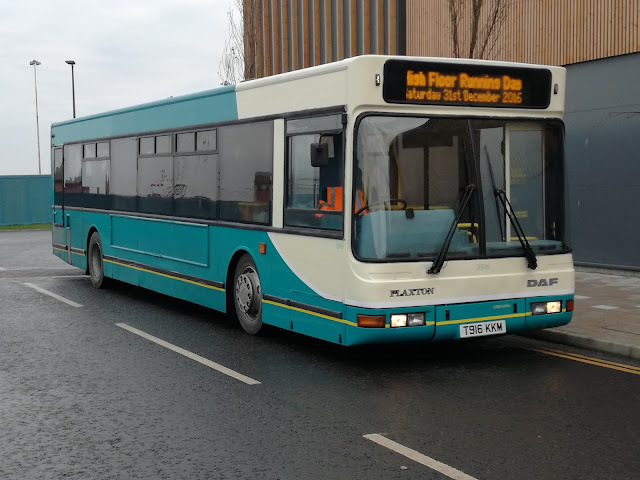 An Arriva Sapphire 15 reg E400. 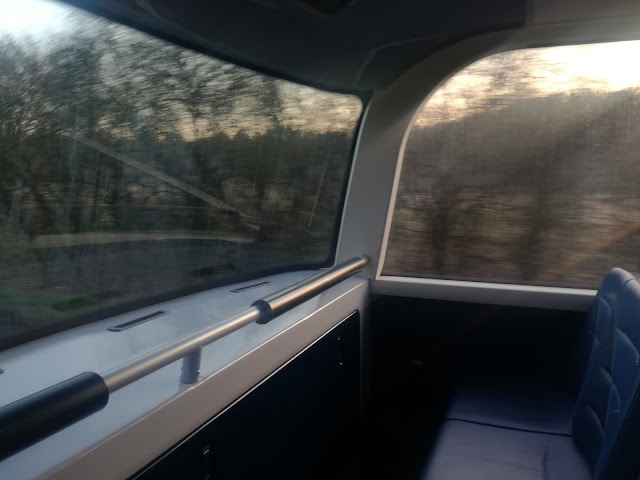 Leather seats, plastic panels, rattles, horribly uninspiring. But something to compare everything else I travelled on to. 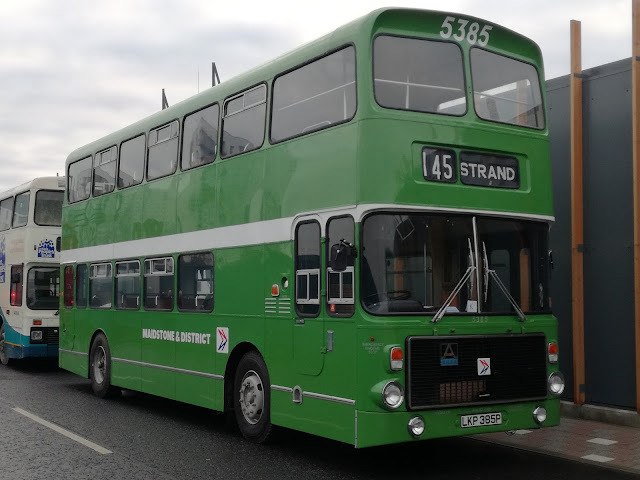 Bus 1 of the Running Day was Nu Venture's Alexander bodied Leyland Olympian F346 WSC, which was new to Lothian buses in 1988. It was driven yesterday by Norman Kemp, owner of Nu Venture and no it didn't feel 28 years old. A better ride and less rattles than the E400 26 years its junior and soon we were at the base for the event, Asda in the old Chatham Dockyard. I hadn't been aware there would be so many visiting buses, and my heart leapt when I realised I would be re-united with some old friends. First up was former Arriva Kent & Sussex Plaxton Prestige bodied DAF SB220 T916 KKM. I remember this batch brand new as 6 of them were vinyled for my local route. 916 was new to Northfleet, but saw work out of several Arriva depots before finishing its life at Southend last year. I'm delighted one of the batch is being preserved, and although I didn't have time to ride it yesterday I certainly will as soon as possible. An unusual visitor was this East Lancs bodied Scania N113 owned by Hams Travel of Flimwell in East Sussex. Sadly it didn't operate any services but it was good to see it there. After meeting up with Stagecoach bigwig and old friend Matthew Arnold the next ride was a bit special. 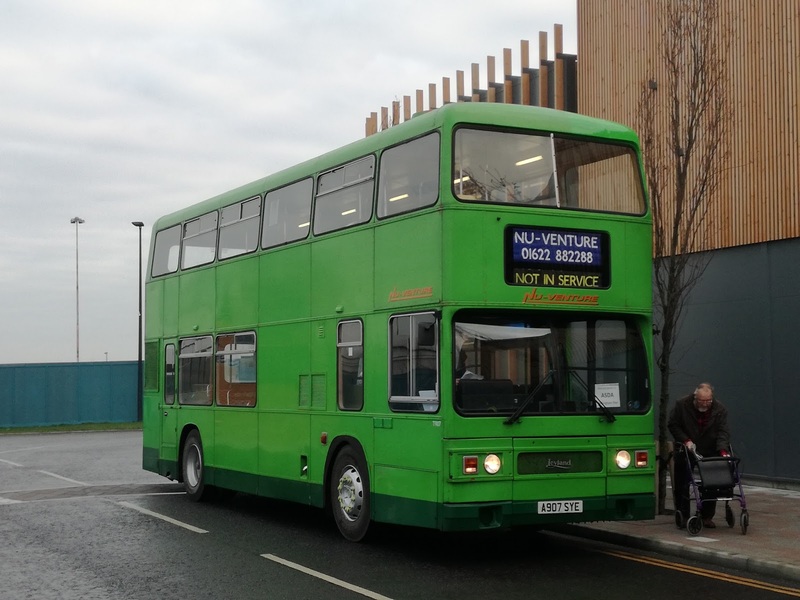 Nu Venture had two Leyland Titans in service until very recently, and New Year's Eve was A907 SYE's swan song. Again there was nothing wrong with this bus, yes the windows rattled a bit but the seats were comfy, ride smooth, no jerky braking and the old bus defied its 33 years of life, most of it in London. 907 is joining its sister 901 in private preservation and again that's good. Farleigh Coaches of Medway sent along two Northern Counties bodied Volvo Citibuses. Again a bus I'm familiar with, having driven them in London their distinctive B10M engines with the unique brake noise made them great to drive. FHZ 9600 started life as VC19 G119NGN and London General and has done the rounds before ending up in Kent. Now classified as a coach there's another potential 3 years at least for this bus on school work and private hire. That's it for Part One. Much more to report, with a Routemaster shaped Dart included, and I'm the last ever passenger in public service on an Olympian. Part Two will be up soon, and I will also be announcing the 2016 Steve Awards, and believe me it has not been easy this year!